Mentors who attended the program were Dr. Nicole Evans, Gailya Porter, Dr. Gwendolyn S. Prater, Dr. Valerie Rovin-Campbell, Katie Hester, Stephanie D. Nellons-Paige, Azaria Edwards, Chanel Norphlet, Jasmaine Jenkins and Meredith Creekmore. Also appearing were Sandra L. Hodge, Dr. Rhea Williams-Bishop, Gwen Caples, Dr. Lurlene Irvin and Jasmaine Moore. Rounding out the list were Faith Donaldson, Mykela Croft and Destiny Jamila Harris. 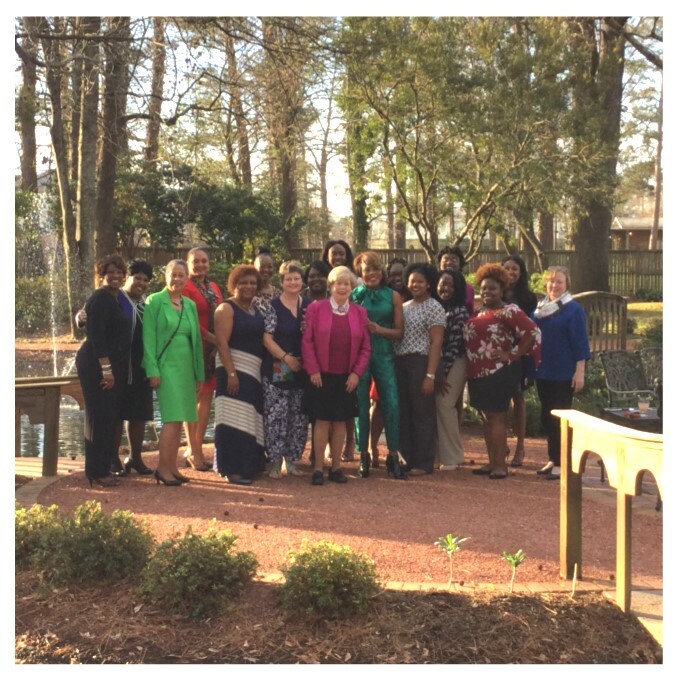 Members of the Jackson State University Women’s Council for Philanthropy and its student ambassadors were welcomed to the president’s home by interim First Lady Stephanie Nellons-Paige at a recent social event developed as a part of the council’s new mentoring program. The Women’s Council established the program to encourage more interaction among its members and the student ambassadors who plan and implement monthly philanthropic activities. Students learn more about the council, its members, goals and outreach efforts as they develop a personal philanthropic outlook. As the afternoon progressed in a fun and relaxed atmosphere, Nellons-Paige, along with council members, special guests and staff used the opportunity to get better acquainted with the students who were “in awe” of the president’s house. Last August, JSU and the University of Mississippi Women’s Council for Philanthropy met to share best practices and gain insight on the structure and execution of their programs. Meredith Creekmore of Jackson, a founding member of the Ole Miss Council and current member of the JSU Women’s Council, also attended the social at the president’s house and spoke fondly of her participation with the JSU Women’s Council. Created by the JSU Development Foundation in 2007, the Women’s Council for Philanthropy works to increase awareness of philanthropy as a force in shaping the future of Jackson State, as well as to sponsor innovative programs that inspire, educate and engage women and students through leadership, scholarship and mentorship. Each year in February, the council requests applications and reviews them based on ACT score, campus activities, community involvement and an essay: “What Philanthropy Means to Me.” Candidates are interviewed by the Women’s Council. Once selected, students elect their own chair, vice chair and secretary and are inducted into the Student Ambassador Program in the fall. Throughout the academic year, they meet monthly in the JSU Welcome Center to plan and implement special activities to encourage philanthropy, especially during “Breast Cancer Awareness Month” and “Women’s History Month.” Their on-campus partner last year was Kids Kollege, and they worked with the Gateway Rescue Mission to help serve lunch to the homeless. Council ex-officio members are Nellons-Paige and Sandra Hodge, interim vice president for Institutional Advancement and interim executive director for the JSU Development Foundation. The Women’s Council has a fund in the JSU Development Foundation with several scholarships established by individual members.